There is a distant land far far away, where giants roam the Earth and music flows as a river. I was lucky to visit that land where pianos grow big as trees, where composer’s fantasy meets the magnificent musical reality and the sounds wrap in their enchanting veil. Coming back from that fantasy, I brought its music with me: powerful yet gentle, haunting yet bright and full of life, melodic and turbulent. 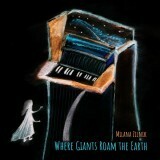 I invite you to the dream, where giants roam the Earth.